The big loggerhead turtles are known for nesting & laying their eggs around the sandy beaches of Cape Verde islands, Sal, Boa Vista & Santiago. Cape Verde islands is the third most important nesting area for the big loggerhead turtle in the world. Turtles are at high risk from hunting for meat, stealing of eggs and removal of sand while building unregulated development towards tourism. The loggerhead turtles in Cape Verde islands are protected by SOS turtle / Turtle foundation when nesting & laying their eggs in the sand, and the hatching is carefully monitored around the beaches. In Cape Verde island of Sal, the loggerhead turtles are nesting and laying their eggs along the whole southern coast, but the best spot for finding them in Sal is probably the southeast coast, at walking distance from town Santa Maria. Walk here, don’t come with a quad since driving at these beaches is forbidden. Even if you visit when the baby turtles have already hatched, you can still find remaining sand holes & empty egg shells along the beaches of Sal. There are also turtle nesting beaches around Boa Vista & Santiago. The loggerhead turtles live in the ocean, but come up to the beach to nest and lay their eggs at night in july, august & september. The female comes ashore usually 3 to 5 times, at intervals of 10 to 15 days, to build a nest in the sand and lay about 100 eggs each time. 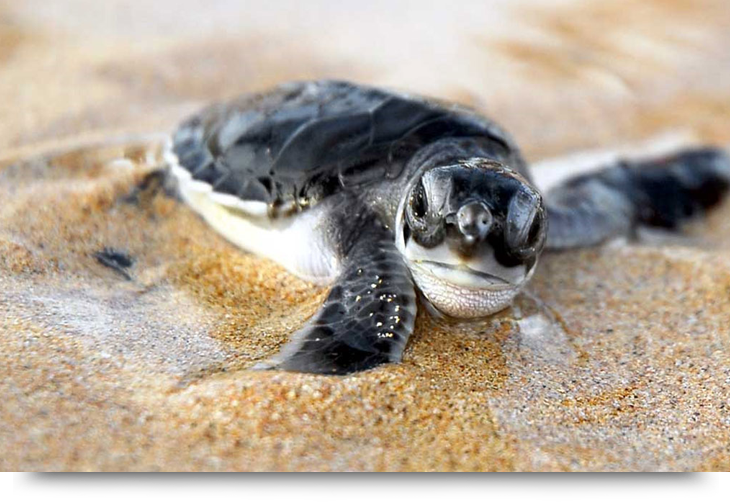 The baby turtles are then hatched after 60 days, in september – december. There are guided tours by the SOS Turtle organisation which also protect and monitor the loggerhead the turtles.